Located in southwest Houston, Houston Baptist University dedicates itself to providing a comprehensive higher education with a strong affiliation with Baptist General Convention of Texas. 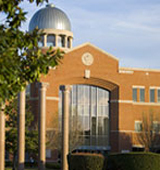 Houston Baptist University educates some 2,200 traditional and non-traditional students. Weekly gatherings called Convocations offer fun and different spiritual growth opportunities. What is a typical Houston Baptist University student like? Describe the type of person that should attend Houston Baptist University. The person should be keen and don't have to be really religious. Because HBU connect Christ to every class. What are the top 3 reasons someone should attend Houston Baptist University? All the professors and staff want to help you succeed in your classes and your entire college career. What was a typical Houston Baptist University student like in high school? Describe the type of person that should attend Houston Baptist University. Houston Baptist University is a unique institution. Founded in faith, HBU grew out of the desire of a small group of committed individuals who wanted to establish a boldly Christian university in a major metropolitan setting. HBU is a university where the foundation of every student's education begins in a faithful understanding of the liberal arts. It is a university where students learn more about the world and themselves, and enjoy an academic experience where faith and learning go hand in hand. Since its inception in 1960, HBU has grown into a thriving community of faith and scholarship. Our students engage in intellectual, spiritual, social, and personal development and transformation, guided by an accomplished, experienced faculty with a passion for teaching, and supported by our dedicated staff and administrators. Thousands of students from Texas, across the nation, and beyond have graduated from HBU to lead meaningful lives of leadership, distinction, and service. And we know there are thousands more to come. Much has changed since our founding - but HBU continues to be defined by the success of those who live and work here. In the HBU community, the pursuit of knowledge does not end when you depart from our campus. Here you will gain lifelong relationships with some of your truest friends - challenge others and yourself to build up treasure not just on earth, but above - and gain an unwavering belief that yes, you can make a difference in the world around you. "We are no longer to be children," Saint Paul wrote, "tossed to and fro, and carried about by every wind of doctrine." As you come to HBU, you can know that you are entering a place that is built for that purpose - not on trends or on passing values, but on seeking after the enduring truth: the truth about our world, the truth about who we are, and the truth about why we are. Come to HBU, and know this is a place of finding, of learning, and of growing - in faith, in knowledge, and in vision. Come to HBU, and become who you are. What are the top 3 things that students do for fun at Houston Baptist University? The top 3 things HBU Huskies do for fun are hanging around with their friends, going to Bradshaw fitness center or go to the fun events like sport games. The average student pays $20,016 for tuition, fees, and other expenses, after grants and scholarships. Learn more about financial aid at http://www.hbu.edu/financialaid. Estimate the net price for you at http://www.hbu.edu/estimator. The typical (median) early career salary of Houston Baptist University graduates is $38,800, according to Payscale. Houston Baptist University participates in the NAIA Division I for college athletics. Want more info about Houston Baptist University? Get free advice from education experts and Noodle community members.